Now that you are all warmed up about OpenRice Malaysia, I have something great to share with you. Besides the fantastic prizes that OpenRice Malaysia always offer on their site for your reviews, there are now starting another contest which will be called "Join & Dine with OpenRice Malaysia". 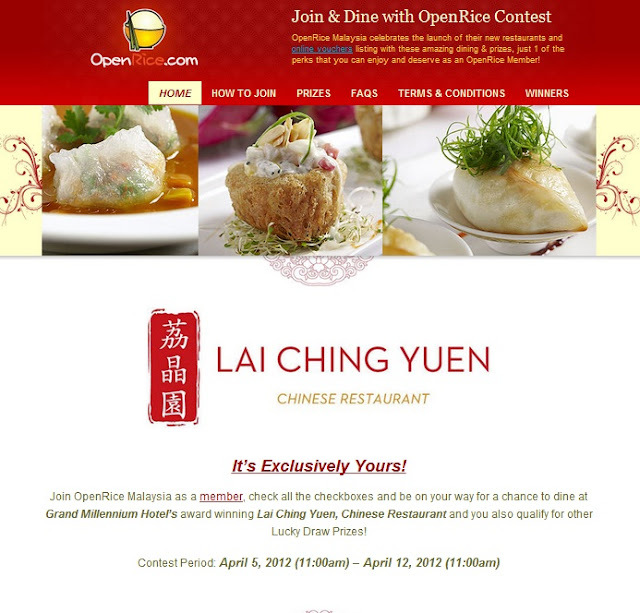 "In celebration of its restaurant and vouchers listings on their website (www.openrice.com), OpenRice Malaysia is rewarding its members with a chance to dine with them at Lai Ching Yuen Chinese Restaurant housed within Grand Millennium hotel, located along Jalan Bukit Bintang. In addition to that, there will also be other cool prizes to be won in the lucky draw." A little teaser of what you will be having on that day. "Like an evocation of its name, Lai Ching Yuen presents a lush sensory experience as much as a gastronomic one. The décor, two Chinese garden pavilions joined to form a main dining area, and its stunning red and black interior create a glamorous setting for some of the best Cantonese cuisine this side of Guangzhou. 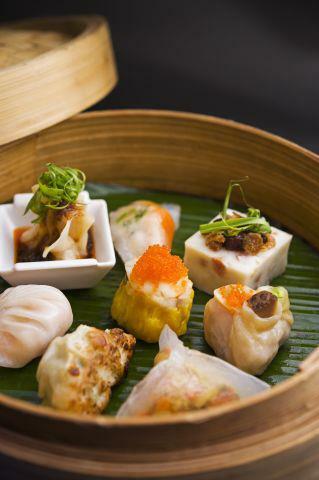 And the food, award-winning Cantonese delicacies accented by silver and jade table settings, take the traditional refinement of Cantonese cuisine to dizzying heights." How about that? A chance to dine at such a great restaurant and chances to win prizes as well! To qualify for the Join & Dine with OpenRice campaign, one is only required to register as a member on our website (http://my.openrice.com/registration/register.htm), agree to sign up for newsletters and promotional information (checked by default), and link their account to their Facebook account. Here is the terms and condition as well. 1. The Join & Dine with OpenRice contest is only open to Malaysian citizens residing within the country. 2. To qualify, participants need to register as a member on OpenRice (Malaysia) website; check the checkboxes “Signup for OpenRice's regular email newsletter for our latest updates and events.” and “Signup for special promotion and discount email alert offered by OpenRice and our other partners.”; and link their accounts to their Facebook account. 3. Members with incorrect details will be automatically disqualified. 4. Staff of Openrice Malaysia and their immediate families are not allowed to participate. 5. Winners will be drawn via Third Party Draw Service on random.org. 6. Winners will be notified by e-mail. 7. The list of user names of participants will be published online. 8. Prizes must be collected from the office of Openrice Malaysia, located at Menara UOA II, KL. 9. Openrice Malaysia reserves the right to substitute prizes with those of equivalent value at our discretion without prior notice. 10. All decisions made are considered final. 11. For further information, please e-mail marketing@openrice.com.my or tweet us @OpenRice_MY. So don;t wait, just register yourself and grab this chance!